Learn more about the Fjordhorse, as well as the Bluebird Lane philosophy, our 50 acre farm, and Lori and Stefan, founders of Bluebird Lane. Find out what it really means to get a Bluebird Lane Fjord, and how we care for your success. 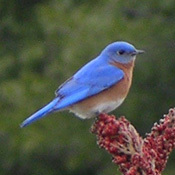 And, the reason the farm is called Bluebird Lane. Hint: it has to do with love and happiness! We are Lori Albrough and Stefan Vorkoetter, owners of Bluebird Lane Fjords. 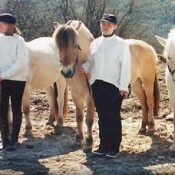 We have been living our dream for the past twenty years of building up our farm and helping make our clients’ dreams come true with our top-bred and top-trained Fjordhorses! Fjordhorses are always dun coloured. The majority are brown dun, with the remainder being either red dun, grey, white dun or, rarely, yellow dun. 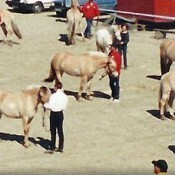 All Fjordhorses retain the primitive markings, which include a dark dorsal stripe, and zebra striping on the legs and, occasionally, across the withers. The mane is trimmed in a crescent shape to emphasize the graceful curve of the neck and the white outside hairs are often cut shorter so the black stripe is visible. 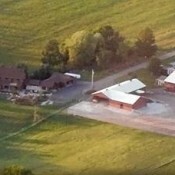 Everything at the farm is geared to the safety and well-being of the horses. Our facilities are set up to allow them to express their “inner horse-ness”, while they develop strong bones, joints, feet, and lungs, running and playing with their friends in our large pastures. 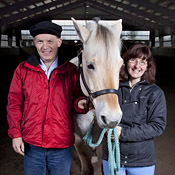 Our Fjordhorse Resource Centre contains articles on a variety of topics including colour and markings, training, breeding, and visiting Norway and the Norwegian culture. Enjoy reading through them, and leave your comments, questions, and suggestions!